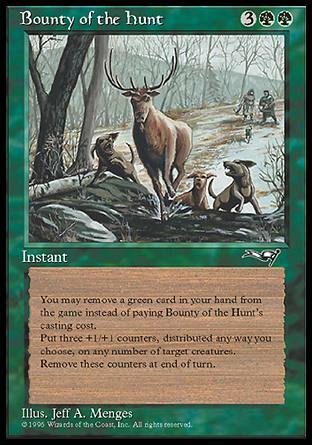 card text: You may remove a green card in your hand from the game instead of paying Bounty of the Hunt's casting cost. Put three +1/+1 counters, distributed any way you choose, on any number of target creatures. Remove these counters at end of turn. best green pump card ever, period. Try it with a wennie pum ..